1 A competitor must refrain from speaking unnecessarily to a judge until judging is complete. 2	The judge’s decision is FINAL. 3	A judge may require a pony which constitutes a danger to leave the ring. 4 Ponies must be registered and entered, at any show, in the name of the legal owner or lesee. All ponies must hold a valid FPS passport and be registered in the main section of the FPS Stud Book; ponies registered in section X are excluded from showing. 5 All ponies exhibited must be entered in the name under which they have been originally registered with the Fell Pony Society or National Pony Society. 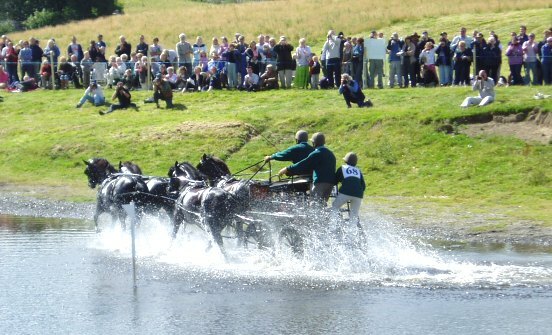 6 Fell Pony Society Pony registration number must be entered on the entry form. 7	No substitution or nominated entries permitted. 8 An exhibitor may not knowingly exhibit a pony bred, sold, leased or produced by the judge, his/her immediate family or his/her employer. (The judges’ prefix is shown on the judges list and in the show schedule). 9 A rider may not ride in a class judged by someone for whom he/she has ridden in competition during the current year. 10 An exhibitor may not show under a judge for whom he/she has produced a pony in the same year. For the benefit of these rules, where a pony is leased, it will be treated as the property of the lessee/Borrower, who will be defined as the Owner for showing purposes. 11 The organising committee reserve the right to amalgamate or split classes and alter or amend the running order of classes. 12 Exhibitors must take into consideration that classes may clash. If this occurs, they must nominate which class they wish to compete in. 13 Exhibitors must enter the ring wearing the number allocated for that class. 14 Entry fees will not be refunded unless a medical certificate or veterinary certificate can be provided. It is the responsibility of the exhibitor to ensure their entry is correct, eligible and to be available when called for their class. 15 Any objection or complaint must follow the outline of the Complaints and Disciplinary Procedure. 16 In the event of a show being cancelled, entry fees, less a deduction for administration charges, will be refunded. 17 If any exhibitor, his employee, assistant, or other person having charge of any animal or animals, shall refuse to obey any directions of the stewards, or any of the Society’s officers, such animal or animals shall be immediately disqualified from competing further and be asked to leave the venue. 18 The organising committee accept no responsibility whatsoever for any loss, injury or damage to any person or their property whilst on the showground, car parks or approaches. 19 The mucking out of horse boxes/trailers is not permitted on the show ground and a penalty will be incurred. 20	Exhibitors are advised that all ponies should be insured for public liability. 1 A correctly secured and fitting current BSI standard skull cap/riding hat must be worn at all times when riding. 2 Riders should be correctly attired for Ridden Mountain and Moorland classes, with a correctly fitting hard hat. (A tweed jacket and beige jodhpurs for example, are usually recommended.) 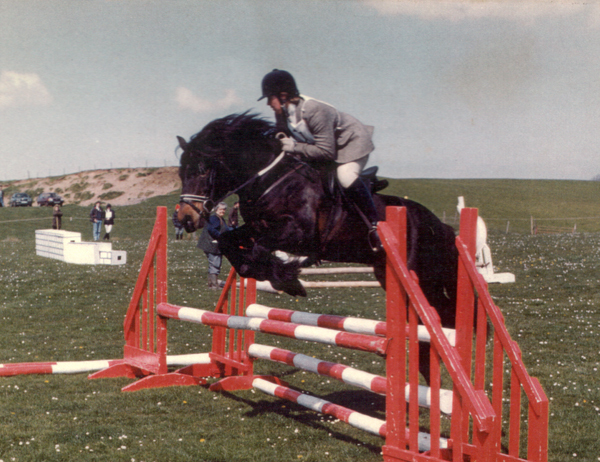 Whilst there are no written rules regarding turnout, it is generally felt that tack similar to that befitting a hunter is most suitable. 3 It is not appropriate to have brightly coloured brow bands, numnahs or reins. Plain leather is all that is required. 4 Only traditional English style riding tack is permitted. (i.e. not Western style). 5	Spurs or dress spurs must not be worn. 6	Show canes and whips are not to exceed 75cms. (30”). If mis-used, in the opinion of the judge, an exhibitor may be sent out of the ring and may be reported to the Fell Pony Society Show Committee. 7 A fall of pony or rider in any class will result in disqualification and they must leave the ring dismounted. 8	Body protectors may be worn and is recommended in all Jumping Phases. 9	Riders or handlers may only compete with one pony in any one class. 10 In Lead Rein classes the leader must be 16 years old or over and may only lead one pony in a class. Whilst in the ring, ponies must be led at all times by the handler. 11	Riders must have attained their third birthday on the day of the show. 12 Competitors shall not ill treat ponies at any time whether by mis-use or excessive use of a whip or bit or any item of saddlery or in any other way whatsoever and shall not cause or allow a pony to jump any hand held obstacle or be rapped. 13 Competitors are responsible for the actions of any non-competitor employed by them or assisting them or representing them or otherwise acting on their behalf and any action or conduct of such non-competitors. 14 Exhibitors and their grooms must, at all times, present themselves in the show ring neatly and smartly dressed. 15 All competitors under the age of 14 years must wear a hard hat to the current standard when showing in hand. 16 Junior whips (aged 16 and under) must at all times be accompanied by a competent adult. 17 Junior whips and grooms aged 14 and under must wear an approved hard hat. 18	Once harnessed and to a vehicle, turnouts must not be left unattended. 19 For other rules and recommendations regarding driving please refer to the rules of the British Driving Society. 1	Ponies to be shown in natural state. 2 Ponies must be shown unplaited and untrimmed, including head, mane, feather and tail, which should not have been previously plaited as the hair should be straight and silky. 3	Eye make-up, hair dyeing or hair extensions are not allowed. 4 Clipping of winter coats on working ponies whilst not encouraged, for showing, is not debarred. 5	Ponies will not be penalised if they have been freeze-branded. 6 Brood mares with foals at foot will be eligible for entry in hand. Foals may accompany mares into the ring but must be haltered and under control of a competent handler. 7	Foals must be a minimum of 21 days old on the day of the show. 8 Foals must only be shown in a halter or leather head collar. No foal to be shown in a bit of any type. 9	Ponies may be shown shod or unshod. 10 White rope or webbing halters may be used to show youngstock. Brood mares, geld mares and geldings may also be shown in rope or webbing halters or in a bridle. Yearlings may not be shown bitted. 11	Brood mares suckling foals are not to be shown under saddle or harness. 12 Ridden ponies will be judged 50% conformation and breed characteristics and 50% ride, manners and presentation in the ring. 13 Ponies must be four years old and over in all ridden and driving classes. The age shall be calculated from 1st January in the year of its birth. 14 All stallions and 3 year old colts must hold a current licence, and MAY NOT BE ENTERED in any young handler or junior ridden class. 15 In Young Handlers classes, all ponies must be a 4 year old or over mare or gelding. 16 Stallions and colts must be adequately bitted and under the control of a handler aged 14 or over. Stallion tack is optional. 17	The wearing of stallion discs is recommended. 18 No ridden pony shall be shown on a leading rein except those exhibited in classes confined to leading rein ponies, or unless otherwise stated in the schedule. 19 Only mares and geldings of 4 years old or over are eligible in junior, lead rein and first ridden classes. 20	First ridden ponies must be shown in a suitable bridle. 21 In leading rein classes, the lead rein must be affixed to the noseband only. The reins must go directly from the bit to the rider’s hands. Must be shown in a snaffle. 22 In first ridden classes ponies must not be cantered except in their individual show. 23 In Novice Ridden classes snaffle bits must be used. 24 Bit-less bridles are not permitted. Any suitable bridles may be worn in working hunter classes. 25 Protective leg boots of a plain colour may be used for working hunter classes, jumping phase only and are not permitted for any other classes. No bandages, over reach boots or protective pads on pony’s legs or feet are permissible. Normal shaped plastic stick-on shoes are permissible. 26	All ponies must be attended at all times. 27 Exhibitors should be aware that rules for other Societies and shows may differ from the above and they should be conversant with these rules if they are competing in Shows organised by other Societies. 2 Once a class has begun, there must be no substitution of rider or handler without the judge’s permission. 3 Competitors are not allowed to leave the ring or withdraw from any class in progress without the judge’s permission. 4 If an exhibitor leaves the ring for any reason, they must not re-enter without permission from the judge. 5	The class ends when the judge, via the steward, dismisses the class. 6 No person other than the judge, and the official course builder appointed by the show committee, is permitted to alter the course in working hunter classes. 7	Consideration must be shown to other riders and competitors at all times. The FPS Handbook for showing and competing (August 2018) can be downloaded here for printing.